Of all emotions that are experienced during “Downfall,” the one that we can never anticipate feeling is empathy. No, not empathy for people or for the circumstances that place them in such ominous situations; here is a movie where it is clear from all angles that those involved have made their bed, and are deservingly lying in it. Yet as the dream around them crumbles into heaps of rubble and their followers become corpses in crowded alleys, we watch the hope and strength fade from their faces and, in a brief moment, reveal some small traces of common human dignity as they prepare to accept their fate. Like the characters of the best of Shakespeare’s tragedies, the men in women of Oliver Hirschbiegel’s magnificent opus occupy the narrative like shattered mirrors of themselves, retreating to the safety of their self-delusions and often reflecting on the reasons for their impending doom with great emphasis, as if to quietly confess their evil and seek some semblance of respect before the end comes. History proved that more than disaster brewed beneath the exterior of the father of Nazism. An angry, nihilistic and spiteful monster, he was nonetheless a man with such an intense drive that his radical cause became the voice of the German people for 12 years. He was, also, an ordinary human being, a fact that is easily dismissed by historians (and filmmakers) because of the great evil he brought into this world. Yes, but true evil can only happen if it comes from the human condition, otherwise it is merely nature taking its course. And nothing natural occurred in the years of World War II when tens of millions were slaughtered like cattle in his name. 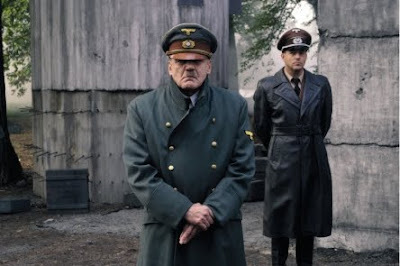 The key to creating a functional movie about Hitler depends on these acknowledgments, all of which are underlined – and thoroughly dealt with – in “Downfall.” The Hitler of this endeavor is a fearsome, loathsome, loud and delusional being, caught up in such an overwhelming denial that he blatantly refuses surrender, even when the walls of his city crumble around him. And we believe this is exactly the way it happened, too. Bruno Ganz, so ordinarily gentle and sublime in his roles, takes hold of the job with clenched fists; his manner of expression, the ferocity of the delivery and the growl in his voice are so meticulous and researched, there is seldom a moment we consciously think about it as a performance. Ganz knows the challenge he is faced with by playing such a notorious historical figure and simply doesn’t let it divert him. It is a full and uncompromised embodiment. Much of the movie takes place in his underground bunker beneath the Reich Chancellery, where all the key figures of the Nazis retreated once it became apparent that fate was no longer on their side. Here we observe as ill-fated military orders become the veneer of a dictator no longer in touch with his reality, as Russian soldiers march closer to the city’s center and he ambitiously moves armies around on a map hoping for an effective strategy. The armies, of course, no longer existed by then, and no map could tell the Führer of just how far gone Berlin had become. But he was not one to submit or escape, despite the pleadings of even his closest advisers. Only Albert Speer (Heino Ferch), the Reich’s chief architect, has the audacity to encourage his superior to stay rooted to his cause to the very end, even though everyone knows that certain death was imminent. “You must be on stage when the curtain falls,” he proclaims. The Bunker itself is a cold, dank and depressing labyrinth of narrow halls and passages that seem to wind with never-ending determination. We sense that the dread of the characters is made all the more potent by their existence in it rather than just by the situation going on above ground; once thriving individuals in the streets of a city that showered them in rude luxuries, they have now been reduced to mere rats in an underground maze. As the men closest to Hitler huddle around their relentless leader, regaling each other with memories of better times, others begin to let go of the idealism and deal with the reality, often with jolting consequences. Consider, for instance, Magda Goebbels (Corinna Harfouch) – mother of six beautiful children and wife to Joseph, the German Minister of Propaganda (Ulrich Matthes), she is the portrait of unflinching success and drive, and no doubt any woman of any class would spend hours envying her. But the mask of her ideals falls abruptly when it becomes apparent that Hitler intends to commit suicide, leaving the Reich she loves so dearly in inauspicious shambles. Her story comes to a close with a final act so heinous and despicable, it can never be fully fathomed. That a single man and a group of his dedicated followers could persuade an entire generation of thinkers to follow so totalitarian a road as that of Nazism says something both genius and horrifying about our humanity. Our positions, our one-track minds could not comprehend the sadistic nature of an idea until it was far too late to reverse the act. We failed our fellow man in ensuring his safety in a time of great world economic clout, and we failed to see, to open our eyes, to the danger of rhetoric that was devised to manipulate a vulnerable populace into a position that would ultimately leave blood on its hands. This is a movie that forces us to confront those failures by viewing them from the inside – it is an unflinching, hard, relentlessly honest movie that refuses to ask questions that have easy answers. It is also brilliantly acted, written and focused, and directed by a man who knows that the path to understanding lies in the assertion that our most notorious villains wore the same flesh and blood as every man and woman that has lived on this Earth. *If you are to read any of the material this movie is based on, Fest’s book is the best place to start. What an excellent review of this dark, horrifying movie. You described it just as I would if I could write as well as you do. Excellent, accurate, spot-on, eloquently written reivew! A movie that is hard to watch, but is very important since, like you say, it reminds us that history's biggest monsters are flesh and blood, just like us.